My life, as my dad calls it, of being a horse trader started around 10 years ago. I was 19 years old and my mom introduced me to the grand world of auctions. Soon after my brother, being a minor, illegally set up his own eBay account and my life of buying and selling was on it's way. For years my brother and I would go to the Goodwill auction, twice a week, every week. Most of the people who attended knew each other, a lot of them were friends. I met a lot of nice people there, people that I saw twice a week, every week. And then, I got a job. Tuesday, after being absent for six years, I returned. I walked in and pulled out my wallet. As I started to pull out my ID the auctioneer looked at me and asked, "What's that for." I replied, "I need a number." "Why" he asked, "it's 691, right." He remembered, after all these years, he still remembered my number. As I walked around, people that I hadn't seen in many many years walked up to me and asked, "Where ya been?" What a funny question. Where have I been? I've been gone for 6 years but it seemed like only days, or perhaps weeks. "How is your brother doing?" they would ask. When I told them that he was in Italy they all said the same thing. "Wow, must be nice." One lady, presumably in her seventies, called me an Old Timer. "You were here before I was," she said. I knew I recognized you, we all did, all of us. So there I was. I was back where I started and it was a happy place to be. 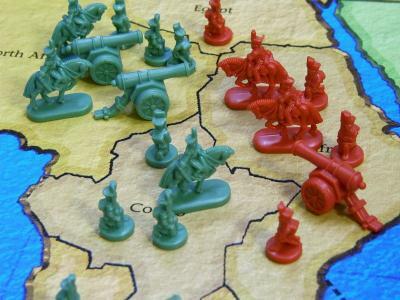 Have you ever played Risk, the game of world conquest? For those of you who are unfamiliar with this classic game, here are the basics. You have an army. Your friends have armies. You build your armies by conquering and maintaining territories. The more you have the more you accumulate. Risk is about taking calculated risks. Taking on another army could mean great loss or great gain. Money, I've come to realize that my perspective on money varies greatly from most peoples. When I look at my bank statements I see little Risk soldiers. It's a game that I'm trying to win. Sometimes I will look and see that my army has grown in size. Other times I will see that a 1000 soldiers are MIA. Where did they go? A bill, that means that the enemy has killed some of my soldiers. Hopefully not too many. I do realize that some soldiers have to die to maintain control. An investment, that means that my soldiers are temporarily separated from the main army but will hopefully be back soon with reinforcements. I'm continually moving sections of my army from place to place, fighting, trying to gain more soldiers. Now even though I realize that this game is impossible to win I still enjoy playing it.